Rather than telling yourself you CAN do it, tell yourself you ARE doing it! You ARE doing it! Celebrate your action today. Do you ever have days where you feel discouraged about the progress you’re making with your business? You know, those days where you’ve launched something new, and you check your email about 100 times that day to see if anyone’s emailed you about it, only to find your inbox empty? It might feel like you’re not making progress but you are. With every project, idea or product that doesn’t take off, you’re growing and learning. It might just be one small thing that needs tweaking and away you go. A few years back when I was pregnant with my third baby, I attended an antenatal program (at www.birthtalk.org) where the facilitators encouraged partners and support people to say: “You are doing it,” rather than “You can do it.” By saying “ARE” instead of “CAN”, it turns a possibility into a reality, brings you into the present and empowers you. Those words have stuck with me and when my birth clients say “I can’t do this,” those words can be like balm to help them centre and focus on what they are doing. So if you’re feeling discouraged or stuck, rather than telling yourself you CAN do it, tell yourself you ARE doing it! 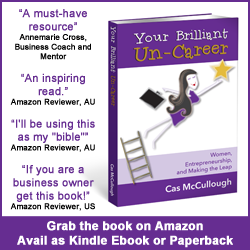 Cas McCullough is a content marketing strategist and author of Amazon bestselling book Your Brilliant Un-Career: Women, Entrepreneurship, and Making the Leap. She is the founder of Brilliant Content and Writally and hosts the Your Brilliant Un-Career podcast. In 2014 her consultancy was honoured as one of Australia's 100 coolest companies in the Anthill Cool Company Awards and in 2016 she won the Collaborate startup comp.